The cheetah is one of the world's most beautiful creatures, and as such has been regarded as a coveted prize for royalty for millennia. Ancient Egyptians often kept cheetahs as pets, and also tamed and trained them for hunting. This tradition was passed on to the ancient Persians and brought to India, where the practice was continued by Indian princes into the twentieth century. It is a native to most of Africa and parts of the Middle East, and is the only extant member of the genus Acinonyx. 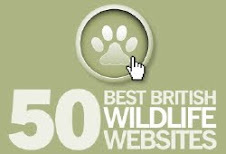 However, what makes this big cat species truly special is that it can run faster than any other land animal. In short bursts it can reach a top speed of between 70 to 75 mph. The Cheetah also has the ability to accelerate from 60 mph in just shy of three seconds! 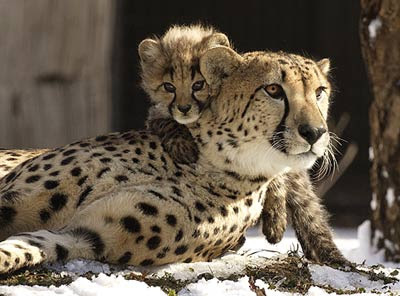 The cheetah is a carnivore, eating mostly mammals under 40 kg (88 lb). In the wild, cheetahs would usually prey on the Thomson's gazelle, the Grant's gazelle, the springbok and the impala. However, the young of larger mammals such as wildebeests and zebras are also taken, and adults too, when the cats hunt in groups. On occasion they will also prey on Guineafowl and hares. While the other big cats mainly hunt by night, the cheetah is a diurnal hunter. This means that cheetahs usually hunt either early in the morning or later in the evening when it is not so hot, but there is still enough light. 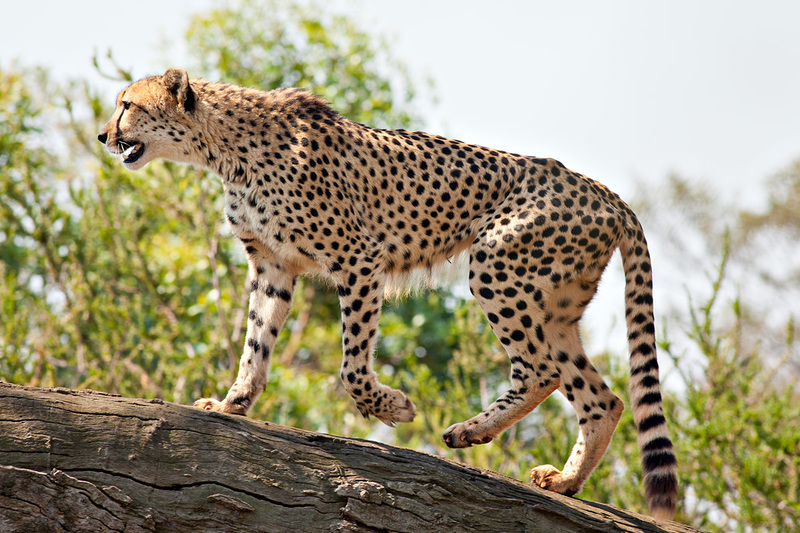 The cheetah hunts by vision rather than by scent. Prey is stalked to within 10–30 metres, then chased. This is usually over in less than a minute, and if the cheetah fails to make a catch quickly, it will give up. The cheetah has an average hunting success rate of around 50%. 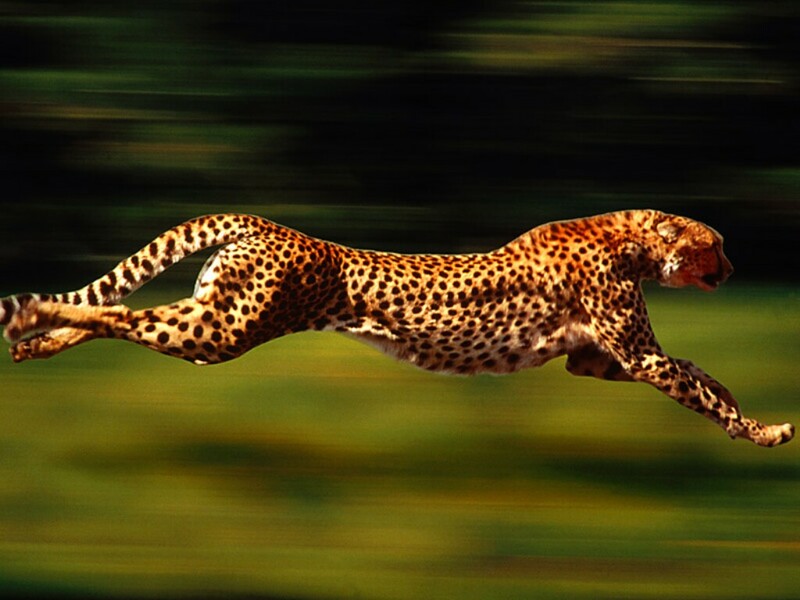 Running at speeds between 112 and 120 km/h (70 and 75 mph) puts a great deal of strain on the cheetah's body. When sprinting, the cheetah's body temperature becomes so high that it would be deadly to continue; this is why the cheetah is often seen resting after it has caught its prey. If it is a hard chase, it sometimes needs to rest for half an hour or more. 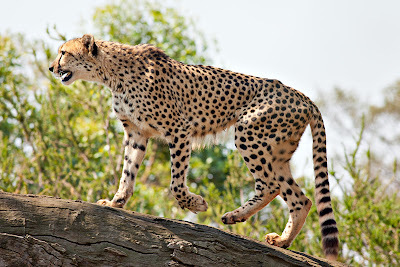 The cheetah kills its prey by tripping it during the chase, then biting it on the underside of the throat to suffocate it; the cheetah is not strong enough to break the necks of the four-legged prey it mainly hunts. The bite may also puncture a vital artery in the neck. 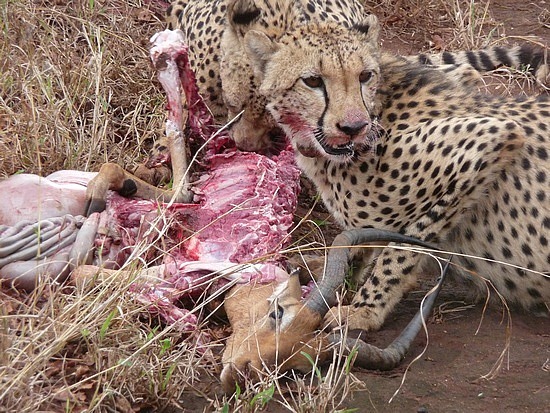 Then the cheetah proceeds to devour its catch as quickly as possible before the kill is taken by stronger predators. On the open Savannas of Iran and parts of Africa, cheetahs are superb examples of specialization - the evolutionary adaptation to very specific environmental conditions. In this case, the specialization is for speed. Going after impalas, gazelles and small wildebeests, the cheetah is a blur, and the chase is short-lived, typically lasting about 30 seconds. Cheetah mothers spend a lot of time teaching their cubs to chase, sometimes dragging live animals back to the den so the cubs can practice the chase-and-catch process. When a cheetah overtakes its prey, it knocks it down and takes it out with a bite to the neck. It then eats as quickly as possible. If a lion comes along, the cheetah will abandon its catch - it can't fight off a lion, and chances are, the cheetah will lose its life along with its prey if it doesn't get out of there fast enough. The cheetah is a vulnerable species. Once widely shot for its valuable fur, it is now at risk from loss of habitat and prey. 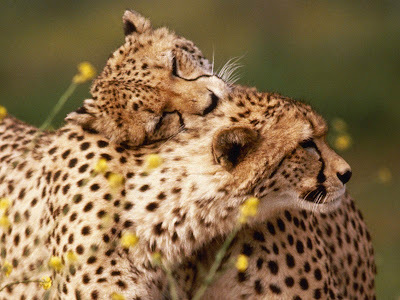 Once numerous in India, the cheetah became extinct there in the 1950's. Less than 30,000 remain in Africa. Cheetah cubs have a high mortality rate due to predation by other carnivores, such as the lion and hyena, and perhaps genetic factors. It has been suggested that the low genetic diversity of cheetahs is a cause of poor sperm, birth defects, cramped teeth, curled tails, and bent limbs. Some biologists even believe that they are too inbred to flourish as a species. It is thought that the species went through a prolonged period of inbreeding following a genetic bottleneck during the last ice age. However, even though they lost most of their genetic diversity thousands of years ago, their decline appears only in the last century or so, suggesting factors other than genetics are mainly responsible. 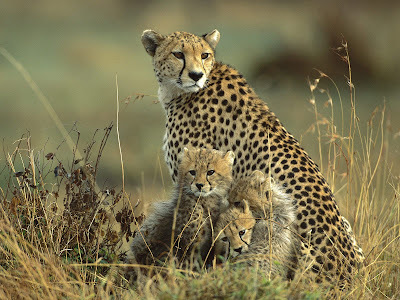 There is no particular breeding season and cheetah cubs can be born at any time of year. After mating the male will leave the female, who rears the young when they are born some three months later. The cubs are born in a concealed den and are blind and helpless for about 11 days. Once their eyes are opened the mother carries them to different dens every few days. Later, the cubs will follow her of their own accord. This regular moving ensures a clean den and reduces the risk of predators - such as lions - sniffing them out. The young cubs are weaned at about three months of age, after which they follow their mother to each kill and share her catch. They leave her after 13 to 20 months but reason together as a litter for a few more months. The females are the first to disperse, each taking up residence in a new area. The males stay together, but move away from their birthplace. the cubs are finally mature at 20 to 24 months old. Surprisingly, male and female cheetahs have completely different lifestyles. The female can spend up to 20 months looking after each litter of cubs, but she will mainly lead an otherwise solitary lifestyle. She is not aggressive to other cheetahs, preferring to retreat rather than attack. Neither is she territorial although her range may overlap with other females. By contrast, males are rarely solitary, living and hunting in an all male group of four or five animals. This group will often comprise of brothers from the same litter, which will generally stay together for life. Fiercely territorial, each male group scent marks its boundary with urine. 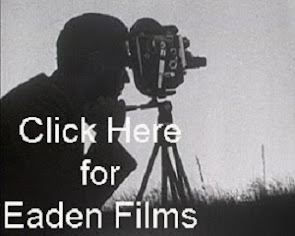 Should other males encroach on the territory of an established group, fierce fights will occur, sometimes resulting in the death of an intruder. Scent is used by females to tell a male when she is receptive, although once the male has picked up her scent the pair will communicate using a series of calls. HOW FAST IS A CHEETAH - THE TRUTH! WHAT DOES A LEOPARD EAT? 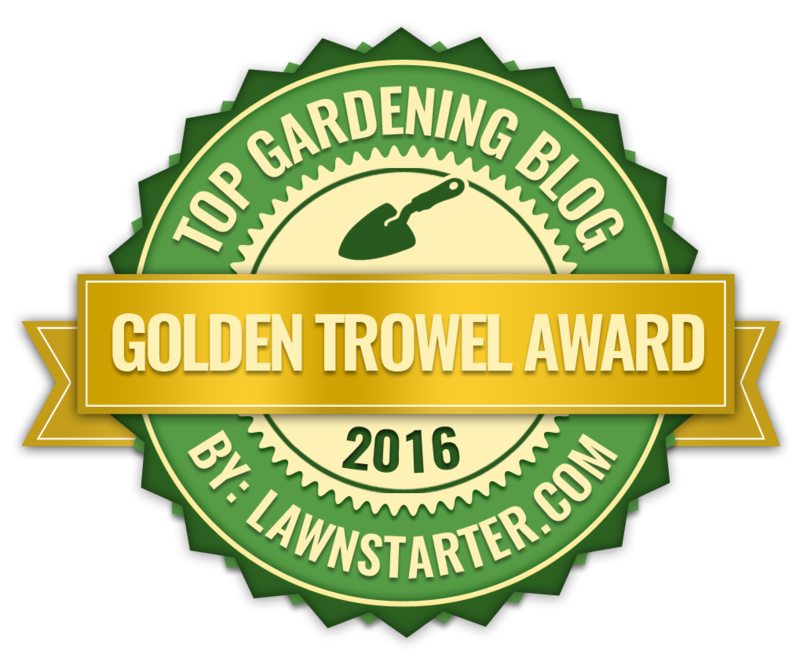 WHAT IS A PLANT BULB?